Hi! This is Alice, the CIR at KPIC. On Sunday, September 30th, I organized a French traditional dance event at the Center and it was a lot of fun! Bonjour ! Le dimanche 30 septembre, j’ai organisé un évènement de danses traditionnelles françaises et ce fut un succès ! The day didn’t start well with a typhoon heading towards Kyoto and causing many people to cancel their participation because of the bad weather. 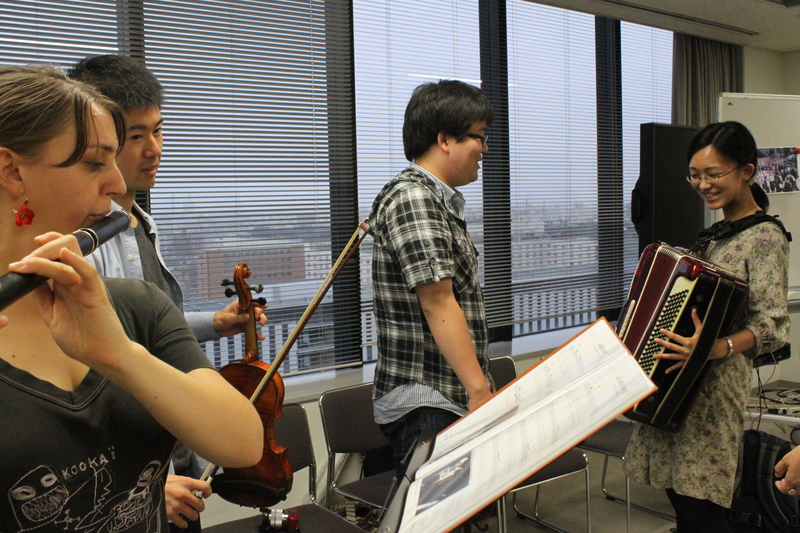 15min before the event, nobody was there and I was wondering if it was going to be only me, the teacher and the musicians! But when the time of the event came, all of the participants showed up and I was so happy and relieved. La journée n’avait pas bien commencé, avec un typhon arrivé en plein sur Kyoto et plus d’une dizaine de personnes annulant à cause du mauvais temps. 15min avant l’évènement, il n’y avait toujours personne et je me suis demandée si je n’allais pas me retrouver toute seule avec le prof de danse et les musiciens. Mais finalement, tous les participants sont arrivés à l’heure sans problèmes et nous avons pu commencer. 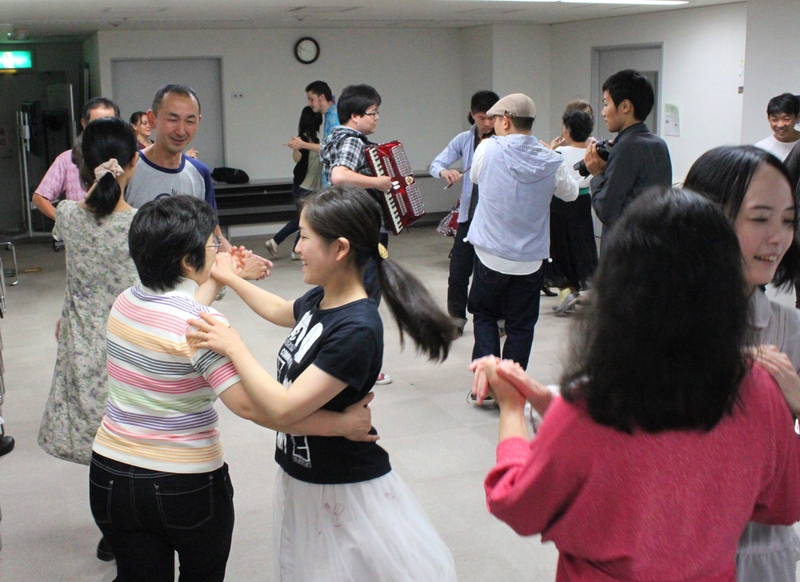 In total, we had 24 people who came to dance their heart out, following the instructions of the French dance teacher and the rhythm of the music played live by 3 musicians. 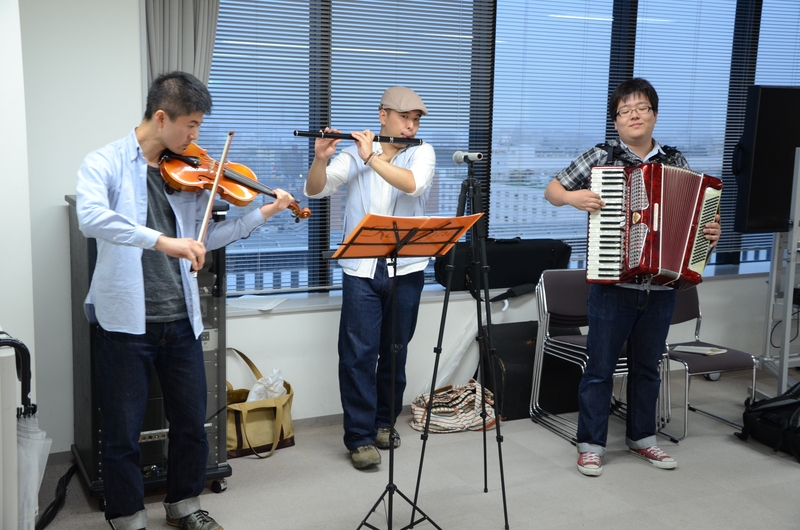 They played flute, accordion and violin, while the teacher sang from time to time. We danced 6 dances from different periods of history and areas of France. There were dances from the Renaissance era, from the Bretagne area and some inspired by the Irish jig. There were 2 dances I really liked in particular: one was danced by the washerwomen in the Middle-Ages, where at some point you get angry at your partner about him or her not having done the laundry. You also had to clap your hands to mime the process of washing the laundry as they did in the past. Au total, nous avons eu 24 participants venus danser au rythme de la musique jouée en live par 3 musiciens et suivant les instructions de Romain Jourdan, le prof de danse. Les 3 musiciens jouaient de la flûte, de l’accordéon et du violon, et Romain chantait de temps en temps en accompagnement. En tout nous avons du danser 6 danses environ, provenant de diverses époques et régions de France. Il y avait des danses de la Renaissance, de la Bretagne, et même une inspirée par la gigue irlandaise. J’ai vraiment aimé deux danses en particulier. La première était la danse des lavandières au Moyen-Age, où à un moment on fait mine de s’énerver sur notre partenaire en lui reprochant de ne pas avoir fait la lessive. Il y avait aussi un moment où il fallait taper dans ses mains comme si on tapait le linge comme à l’époque. The other one was danced in a big circle, with the musicians in the center and the men clapping while the women danced. 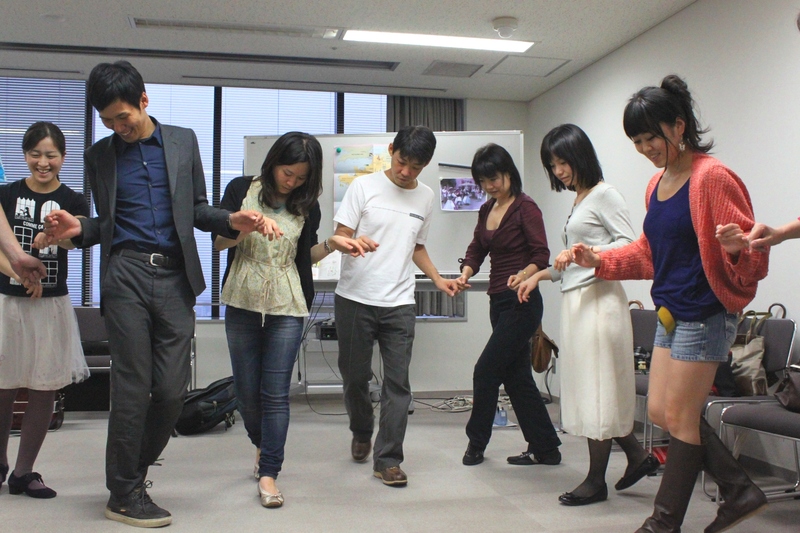 You also get to change partners a lot during this dance, so you can meet and dance with everybody. As the teacher said, “French traditional balls were not meant to dance only, but to meet people, interact with them, and why not, meet a wonderful man or woman”. I wonder if some of the participants did? L’autre danse commence par un grand cercle avec les musiciens au milieu et les hommes qui marquent le rythme en tapant des mains pendant que les femmes dansent. Il fallait ensuite changer de partenaire et de direction assez souvent, ce qui permet de danser et de rencontrer tous les participants. Comme l’a expliqué Romain, « les danses traditionelles françaises et les bals étaient surtout un moyen de rencontre, et pourquoi pas, l’occasion de rencontrer quelqu’un qui nous plaît ». Je me demande si quelqu’un a fait ce genre de rencontre au cours de l’évènement ? The steps are quite easy and you do not need to be a professional dancer to perform them, but following the rhythm as it gets quicker, changing partner and directions requires a little bit of concentration and you have to really get into the dance if you want to follow it until the end. Participants got into the mood very quickly and laughter as well as chanting voices filled the room the whole time. Les pas sont assez faciles ce qui fait que n’importe qui peut participer, mais il vaut mieux se concentrer si on veut tenir jusqu’à la fin, avec le rythme qui s’accélère et les fréquents changements de partenaire et de direction. Les participants se sont vite pris au jeu et pendant deux heures, la salle a résonné de leurs rires et de leurs chants. 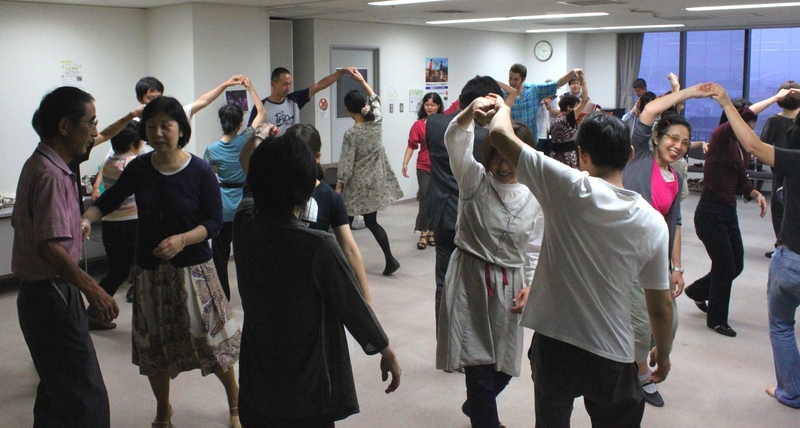 During the break, people talked a lot to each other about what they just learned, France or folk dances. Some tried playing the instruments and discussed with the musicians, while others listened to the teacher’s explanations about France’s regions and their traditional dances. Pendant la pause, les gens ont beaucoup parlé entre eux de ce qu’ils venaient d’apprendre, de la France ou des danses folkloriques en général. Certains ont discuté avec les musiciens et essayé de jouer des instruments, pendant que d’autres écoutaient les explications de Romain à propos des régions de France et de leurs danses traditionnelles. When the last dance ended, many people remained in the room to exchange their contact information and learn about the next dance lessons from the teacher. 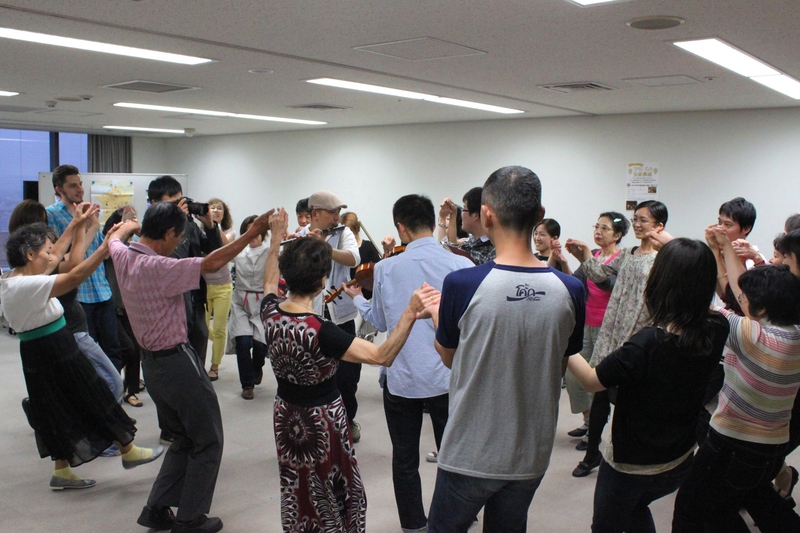 A lot of the participants said they would love to participate again in this kind of event and that they were really happy to have been able to try so many dances during the 2 hours. I want to learn more French traditional dances as well! A la fin de la dernière danse, plusieurs personnes se sont échangées leur contact et ont demandé à Romain quand seront les prochaines danses. Plusieurs participants ont déclaré qu’ils aimeraient beaucoup participer encore une fois à ce genre d’évènement et qu’ils étaient très heureux d’avoir pu essayer autant de danses en deux heures. Ca m’a aussi donné envie d’apprendre plus de danses traditionnelles françaises ! 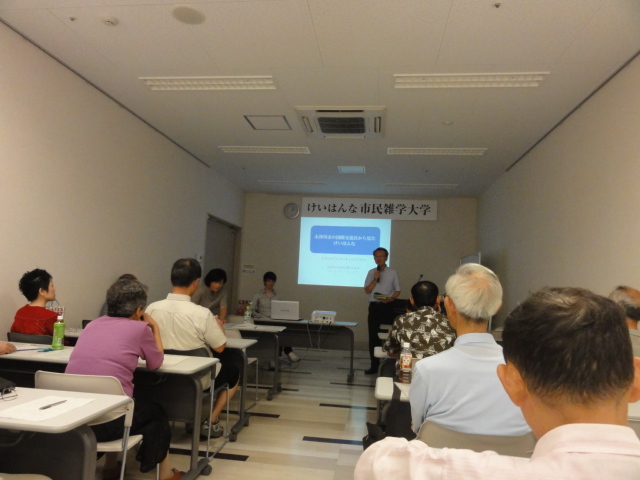 On September 22nd I was invited to speak at the Kizugawa City “Keihanna Citizens Zatsugaku University” Study group about my work as a CIR and the general state of multiculturalism in Japan, as well as implications of the current problems of low birth-rate and societal aging. As part of the presentation I spoke about the current state of multiculturalism in my home country, the UK, and the main ethnic groups that make up the British Population. Japanese population statistics and future projections. 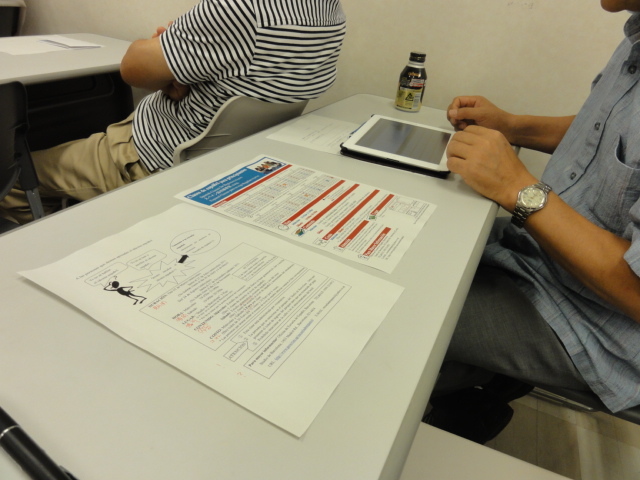 The right hand side includes some of the conclusions from the UN’s report on Japanese population movements. After explaining a little about multiculturalism, I spoke about the growing importance it will have in light of Japan’s population projections. 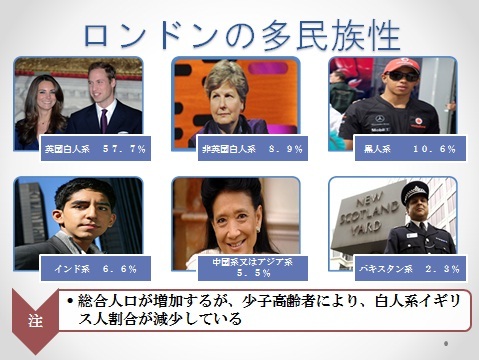 In this respect, there are some common points between Japan and the UK. For example, as in many developed countires, certain section sof the UK population are facing the same issues of low birthrate and societal aging, though as a result of immigration the overall population is increasing. Part of the talk was a discussion of a CIR’s job, particularly the importance of bridging the “communication gap”. To illustrate this I showed the audience two pamphlets, one complicated one aimed at Native Spanish speakers and a simplified pamphlet aimed at people learning Spanish. This is similar to the “simple Japanese” technique we use here when writing information aimed at Japanese learners. 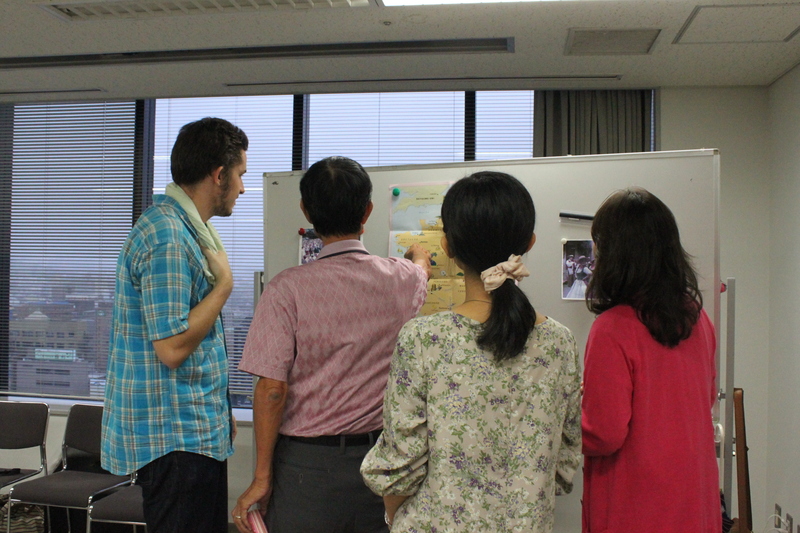 Through this exercise the Japanese audience was also able to experience this “communication gap” and understand the point of view of Japanese learners.. I couldn’t help but be a little nervous! 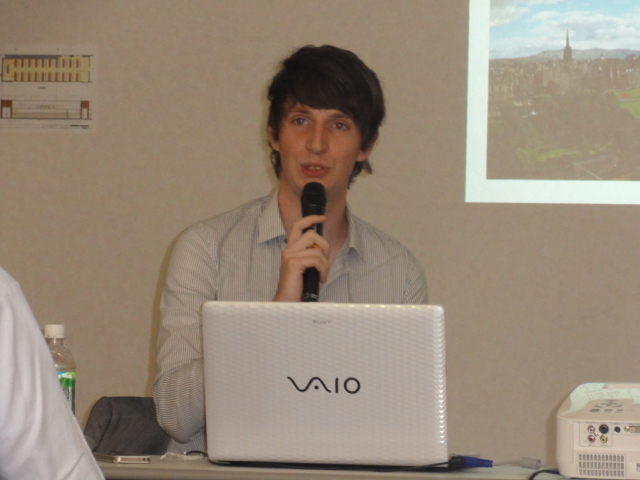 This was my first talk on a difficult subject in front of such a large audience, so I was　quite nervous! After the talk we had a long discussion about the issues raised, and there were a variety of opinions expressed.